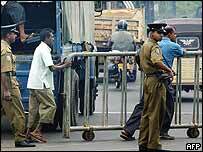 Sri Lanka's prime minister says he is ready for snap elections to resolve a power struggle with the president. The announcement from his spokesman came as the cabinet said peace talks with Tamil Tiger rebels could be in jeopardy because of the crisis. President Kumaratunga has said the truce her prime minister signed with the rebels is illegal. Last week, she suspended parliament and fired key ministers, accusing them of yielding too much ground to the rebels. She has invited Mr Wickramasinghe and senior members of his party to meet her to discuss her call for a government of national unity. Meanwhile, Norwegian envoys arrived in the capital, Colombo, late on Monday to set dates for new peace discussions, but correspondents say these now look very uncertain. Cabinet spokesman GL Peiris said the prime minister was ready to face elections and this was as good a time as any. "We have absolutely no doubt that the people will endorse what we have been doing and we have no problems going before the people." The majority of MPs had come out in support of the prime minister, he said, and favoured giving the president control of the peace process for the time being. The prime minister's stance is that he cannot negotiate with the rebels until key ministries, such as defence, are back in his control. The BBC's Frances Harrison in Colombo says the prime minister may be hoping the rebels will come out on his side in the power struggle and refuse to negotiate with his rival. 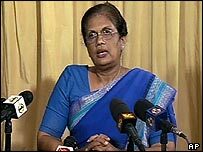 Although Mrs Kumaratunga holds the presidency, her party is the official opposition, having lost elections to Mr Wickramasinghe two years ago. There has been an uneasy cohabitation ever since. The president narrowly survived a Tamil Tiger assassination attempt in 1999 and has been angered at what she says are government concessions to the rebels. More than 60,000 people have died in violence in Sri Lanka since the Tigers launched their fight for a homeland for minority Tamils in the island's north and east in 1983. Mr Peiris, constitutional affairs minister and chief government peace negotiator, said "basic issues" had to be sorted out before talks with the Tigers could resume. "The events of the last four days have cumulatively placed the peace process at some risk," he told reporters on Monday. A day earlier he had suggested Mr Wickramasinghe might hand over the running of the peace process to the president. It was unrealistic, he said, for the prime minister to run the peace process when it was no longer in his control. "Sri Lanka is still a divided island but the last two years have given the people a taste for peace"